Chess8400 is not a new game. Chess8400 is the subset of 8,400 starting positions in Pseudo-Modern Random Chess where the Bishops start in opposite color squares. The remaining 6,720 (of 15,120 total) Pseudo-Modern Random Chess positions have the Bishops starting on same color squares. Chess8400 is really Fischer Random Chess (Chess960) played in a 9x9 board, with the The Prime Minister as the 9th piece, and an extra pawn. Chess8400 is similar to Prime Ministers Random Chess played on a 9x8 board, but the board for the latter was inspired by Capablanca's Chess. -Bishops start in opposite color squares. -The King must be between the two rooks. Pawns (9 of them) are placed on each player's 2nd rank. 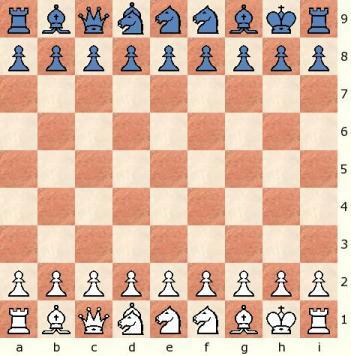 There are 8,400 different legal starting positions in Chess8400. Orthodox Chess pieces are used, plus a Prime Minister (Bishop+Knight) and a 9th Pawn per side. Knight crowned by small Bishop, Bishop crowned with small Knight, and a crownless King. Knights crowned with the heads of Bishops. Most Orthodox Chess rules apply, including the objective of the game, the way pieces move and capture, en passant, check, checkmate, and the various draw situations (i.e. stalemate, insufficient mating material, threefold repetition, 50-move rule). Pawns may promote to a Queen, Minister, Rook, Bishop or Knight. Modified Castling rules are below. 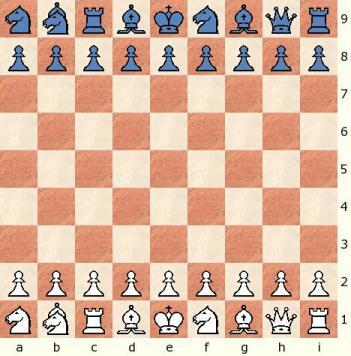 The Chess8400 castling is long to either side of the board and the rules are based on the Modern Random Chess rules. 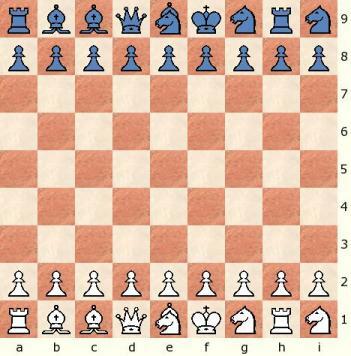 After castling, the rook and king's final positions are exactly the same positions as they would be in Gabriel Vicente Maura's 1968 Modern Chess. Thus, after c-castling (notated as O-O-Oc), the King is on the c-square (c1 for White and c9 for Black) and the Rook is on the d-square (d1 for White and d9 for Black). After g-castling (notated as O-O-Og), the King is on the g-square (g1 for White and g9 for Black) and the Rook is on the f-square (f1 for White and f9 for Black). The King cannot jump over his own rook if and when said rook stands on a 'checked' square. This point is best ilustrated by the sample Fischer Random Chess (Chess960) position below where it's illegal for White to g-castle (O-O) with it's e-Rook, as the King would need to jump over an attacked square. Even though the e-square is occupied by a Rook, it is under attack (or 'checked') by Black's Rook on e8. Castling in Chess8400 is symmetric to either side of the board. Chess8400 Castling is like the Orthodox long castling (O-O-O) but to either side. Click on the above link to view logs of Chess8400 played on Game Courier.